The 2010 MINI Cooper retains all the components that have made it popular with adventurous drivers for years, including one-of-a-kind styling, a sporty driving dynamic, excellent fuel economy, and a wide range of customization options. Most owners consider the MINI Cooper essentially a two-passenger coupe because of its tight rear seat, and cargo space remains in short supply due to the vehicle's unique design and short wheelbase. From its modern-day inception, the MINI Cooper was designed as a sporty small coupe geared toward a distinct audience, and the 2010 version carries that concept forward with few changes. It offers a great ride and handling, but little in the way of rear-seat-passenger or cargo space for families. Still, it easily achieves what it set out to do, and with the introduction of two new design packages for 2010, the MINI Cooper offers even more options for owners who want to make their vehicles stand out from the crowd. In celebration of its 50th year as an automotive brand, the MINI Cooper shows off two new anniversary packages for 2010. The optional Mayfair package includes leather toffee-colored seats, matching interior trim, front driving lamps, and Hot Chocolate exterior paint with toffee-colored racing stripes on the hood, among other features. The optional Camden package goes with a silver theme and includes black sports seats, silver lining on interior surfaces, a Harman Kardon sound system, and White Silver exterior paint with a white roof, white mirrors, and white turn signals. Both packages also include 50th-anniversary grille badges, front foglights, a rear spoiler, and unique 17-inch wheels. The current MINI Cooper design and body date back to 2007, when the automaker introduced the most recent generation, and retains styling cues borrowed from the iconic 1959 Classic Mini, yet updated for modern tastes. For 2010, the MINI Cooper comes in six trims, including the Base Cooper two-door hatchback and convertible, the sport-tuned Cooper S and S Convertible, and the performance-oriented John Cooper Works, also available as a hatchback or convertible. All trims display a wide bulldog stance and feature an ultra-rigid body designed to reduce flex and ensure capable handling, as well as a quiet cabin. 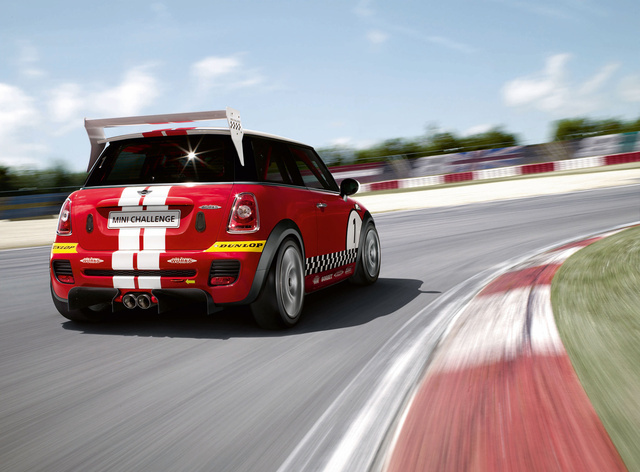 The S and John Cooper Works trims come equipped with a rear spoiler for better aerodynamics, while the convertible trims feature a power-operated fabric top, which opens in 15 seconds. Drivers can partially open the top to create a sunroof effect, although it does result in some cabin wind noise. When retracted, the convertible top stores in a compact space above the trunk. All convertibles also include a heated glass rear window. Each of the MINI Cooper's three trim levels uses a different version of the same 1.6-liter, DOHC four-cylinder engine, with three corresponding sets of horsepower and torque numbers. The engine powering the Base Cooper hatchback and convertible generates 118 hp and 114 lb-ft of torque, driving the vehicle from 0-60 in 8.5 seconds. The Base engine posts fuel economy numbers of 28/37 mpg (28/36 for the convertible), and links to a Getrag six-speed manual transmission or an optional six-speed Aisin automatic. The sportier Cooper S hatchback and convertible trims feature a turbocharged version of the same 1.6-liter engine, which boosts horsepower to 172 and torque to 177 lb-ft. The turbocharged powerplant pushes the S trims from 0-60 mph in 6.7 seconds, and links to the same manual transmission or the six-speed automatic with steering-wheel-mounted Agitronic paddle shifters. Fuel economy numbers for the turbocharged powerplant drop to 26/34 mpg. The John Cooper Works trims, introduced in 2009, add a bigger version of the S's Borg Warner turbocharger and feature modified cylinders and exhaust tuning, which enables the performance-tweaked four-cylinder powerplant to generate a fairly impressive 208 hp and up to 207 lb-ft of torque. The engine drives the JCW trims from 0-60 in 6.2 seconds, with a top speed of 148 mph. Again, fuel economy numbers drop slightly, to 25/33 mpg. The JCW trims come equipped only with a six-speed short-throw manual shifter. All three versions of the four-cylinder engine deliver plenty of pep for a sporty driving experience, although the turbos exhibit some expected turbo lag. Owners and reviewers alike find the MINI Cooper fun to drive, with zippy performance. MINI Cooper recommends premium fuel for all three versions of the four-cylinder engine. In addition to its highly rated performance, the 2010 MINI Cooper receives plenty of praise from owners and reviewers for its crisp handling and precise maneuverability. The Base Cooper trims ride on a Performance Suspension, with MacPherson struts in the front, a multilink configuration in the rear, and anti-sway bars in both the front and rear. In addition, new lightweight aluminum trailing arms in the rear help to reduce weight and increase agility in tight curves, according to the automaker. The Cooper S trims have stiffer shocks and springs than the Base Cooper trims, while the JCW trims beef up the shocks and springs even more, pushing the MINI Cooper's driving dynamics so that it approaches the level of a true commuter sports car. In addition, the JCW trims sit slightly lower than the S trims, delivering a lower center of gravity, more direct handling, and more road feel transmitted to the driver. The JCW trims also come equipped with front Brembo brake calipers with 12.4-inch brake discs. All MINI Cooper trims come equipped with a Sport Button, which drivers can push to adjust settings for tighter steering and better acceleration. Owners of all trims can also opt for an available Sport Suspension, which adds stiffer front and rear stabilizer bars, as well as stiffer springs and dampers, for a tighter, firmer ride. The Base Cooper rides on 15-inch alloy wheels, while the S trims receive 16-inch alloy wheels with an S-Winder design. The JWC trims retain their 17-inch alloy wheels with run-flat performance tires. In addition, owners can opt for a variety of available wheel sizes and designs. The Mayfair package adds 17-inch alloy Infinite Stream wheels in white or silver, while the Camden package adds 17-inch alloy wheels in a choice of designs, including Flame Spoke and Camden-exclusive Silver Shield wheels. With its short wheelbase, the MINI Cooper obviously puts a premium on cabin space. Although front-seat passengers will find plenty of legroom, the seats are somewhat narrow and can feel cramped for some. Back-seat passengers will find legroom tight, with little room to stretch out. The six-way manually adjustable front seats include height adjustment, and a telescoping steering wheel helps ensure a comfortable seating position for the driver. Both the Cooper S and JCW trims come equipped with bolstered sport seats. Leatherette upholstery comes standard on the Base and S trims, while the JCW trims feature cloth upholstery. Owners can add leather upholstery as well as heated front seats as options on all trims. The rear seats split 50/50 and fold down, but do not fold flat. With the rear seats up, the MINI Cooper offers just 5.7 cubic feet of cargo space, but it expands to 24 cubic feet with the rear seats down. Supplemental interior storage spaces include map pockets and a two-tiered, climate-controlled glove box with cooled storage for beverages. All 2010 MINI Cooper trims come well-equipped with such standard features as a leather-wrapped steering wheel with audio and cruise controls, a start/stop button, remote keyless entry, an onboard computer with trip information and outside temperature, air conditioning, and power windows and door locks. A six-speaker AM/FM audio system with a CD player and MP3 input jack also comes standard. Beyond that, owners can customize each trim to their hearts' delight. The automaker offers such options as a dual-pane panoramic sunroof, a navigation system with real-time traffic, Sirius satellite radio, high-definition radio, and a number of types of interior trim, including English Oak, brushed alloy, carbon fiber, chrome, and various door colors. Owners can also choose from 10 exterior colors, 10 types of graphics, and a variety of racing stripes to decorate the exterior. 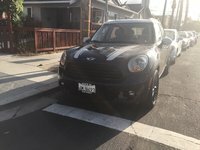 The NHTSA awarded the 2010 MINI Cooper five stars out of five for protecting front passengers in a side-impact crash, and four stars out of five for protecting front and rear passengers in the event of front-end crashes. All trims come standard with a wide range of safety features, including Dynamic Stability Control and four-wheel antilock brakes with electronic brakeforce distribution. The JCW trims add traction control with electronic differential lock control. Six airbags, including front-seat-mounted side-impact and side-curtain airbags, also come standard. By mounting the engine transversely, the MINI Cooper increases the front crumple zone, allowing for crash impact to dissipate over a wider area. Also, in the event of an accident, a crash sensor automatically deploys hazard lights, unlocks the doors, and disables the fuel pump. Safety options include rear parking sensors. The MINI Cooper continues to receive very good marks from owners for its performance and taut ride as well as its sporty handling, top-notch fuel economy, and overall fun factor. Owners especially like the MINI Cooper's unique exterior styling and body and its wide range of options for customization. They find it easy to park in even the smallest of spaces, making it especially popular with urbanites. However, given its small size, the MINI Cooper does have its drawbacks, according to owners. The limited cargo space and small back seat cause problems for some owners, while others would like to see better interior ergonomics. In addition, some find the suspension a bit too firm, especially over rough road surfaces. However, the MINI Cooper receives overwhelmingly positive reviews from most owners. What's your take on the 2010 MINI Cooper? 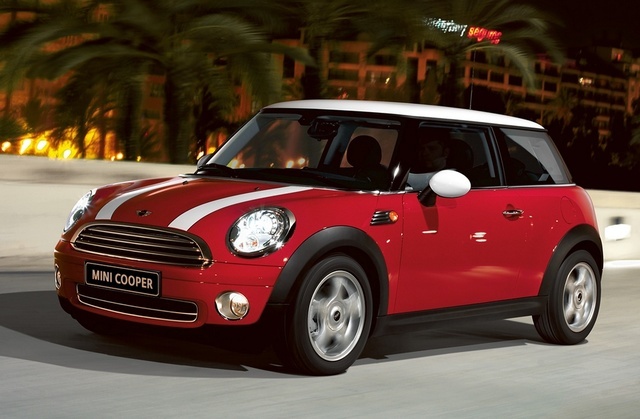 Have you driven a 2010 MINI Cooper?